Westwinds Beachfront Condo - Sleeps 6- Incredible Amenities! You’ll surely linger just a little longer over your morning coffee at the antique-white dining table or breakfast bar. 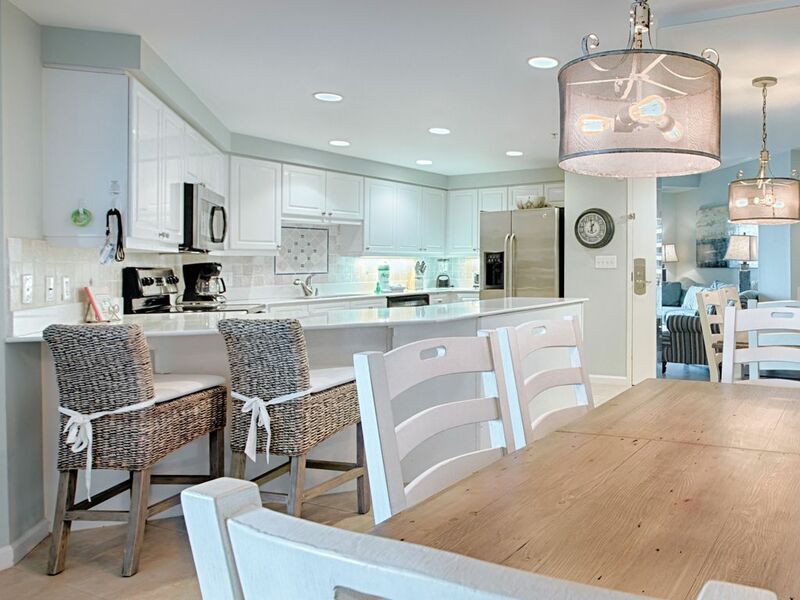 The bright, cheery kitchen flows seamlessly into an airy, open concept dining and living area awash in the calming colors of the Emerald Coast. If a beach getaway doesn’t put you in a sunny mood, relaxing to watch a favorite movie on one of three flat panel HDTVs or getting lost in a great beach read in this fully-furnished charming condo certainly will. Enjoy the freshly remodeled bathrooms with quartz countertops and a walk-in shower in the master. Both bedrooms have king-sized beds with beautiful linens in sea-inspired blues, greens and sandy tans. Located on the sixth floor, the condo’s balcony opens to balmy Gulf breezes and Westwind’s lushly landscaped lagoon-style pool deck below. With glass patio doors leading to the balconies in both the living room and master bedroom, this stellar view is placed center stage, as it should be. Relaxed and cozy, the laid-back charm of this condo will make you feel as comfortable as your favorite pair of faded jeans. Electronic Locking System - no keys to loose or no long lines to stand in to check in. PLUS you will receive numerous discounts to local merchants with this rental!